← Crowd-sourced meta-health writing: wish I’d thought of it first. Fifteen years ago I wrote an article about the waiting room at the Geelong Hospital Emergency Department, noting that a higher proportion of Geelong residents visited it than any other small room in that entire city. Back then it was pretty low-key: rows of bland plastic chairs, and even the pot plant looked unwell. Triage category four unless someone had thought to rehydrate it with a litre of fluid. The room was designed for a single purpose, at which it excelled: waiting. More people died of boredom than infection, with the risk of MRSA overshadowed by that of hospital-acquired catatonia. Unless the four-hour rule has paid dividends, a couple of patients will probably still be waiting for me. I told them I’d see them after my break, but we took generously long lunches back in ’99. They call me Godot. If the footy stadium was Geelong City’s shrine to humans at their physical peak, the waiting room was grand testament to their vulnerability. That pot plant at the front window marked the entrance to a place of sorrow and salvation. Deeper inside ED, there were no windows at all, save those to the soul, which were triaged under ‘ophthalmology’. Emergency doctors are grown under artificial light, their only knowledge of the world outside being gleaned from patient presentation. Surfboard injuries suggest a sunny day, whereas minor road accidents mean it has started to rain. Probably started raining three hours ago –the delay in information transfer is similar to an astronomers’, so one is always viewing the past. The bigger the hospital, the less comfortable its waiting room: a truism designed to discourage the least sick from sticking around with the crowd. The triage nurse plays the role of the maître d’ at Maxim’s: patrons sporting a mere common cold receive disdain usually reserved for Parisians wearing jeans. 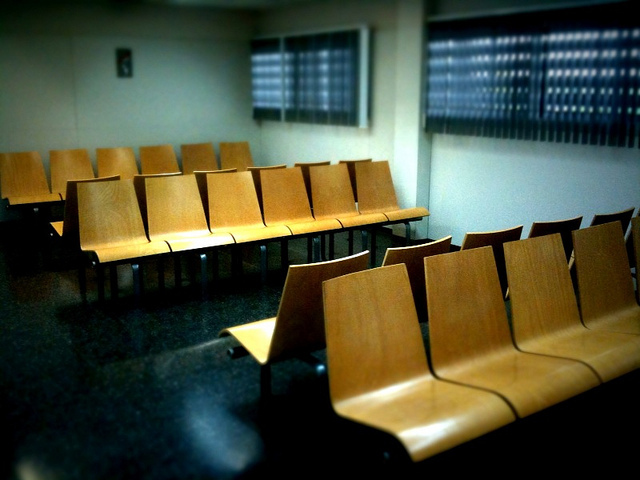 General practitioners’ waiting rooms are an entirely different ballgame, being both friendlier and emptier. Much like your local café compared to Maxim’s – less foreign and fewer waiters. Every doctor should occasionally sit in their own waiting room. I do so, fortnightly. My practice’s waiting room serves as a community gathering place, its absorbing conversations disturbed only by the harsh interjection of ‘Next!’ Playing children spill outside into a community garden and vegie patch, more reminiscent of a scene from Enid Blyton than John Murtagh. Our nutritionist holds a cooking class in the garden every second Friday, using the fresh produce to feed all interested bystanders, showcasing the waiting room at its very best – friendly, communal and tasty. Coincidentally, my fortnightly waiting room stint occurs at Friday lunchtime. My natural leadership qualities and sharp elbows ensure I’m always first in the meal queue. This entry was posted in Uncategorized and tagged Flippant, GP, humour, Medical Observer, waiting room. Bookmark the permalink. This reminds me of a few millennia ago when I was a resident working nights in a busy ED. One blessed night the waiting room (obviously modelled on Geelong’s) was empty – and stayed so for a few hours. The reason for this miracle did not become apparent until some brave soul ventured out and found a body outside the entrance (no CCTV)…. A classic tale, Anne – worth a story in its own right! Despite being surprising, it actually makes some sense: patients would assume that ED staff 20 metres away from a dead body would already know about it. When I worked in remote NT Aboriginal clinics, I used to worry that when we had a life-threatening emergency and I was the only doctor, the receptionists would be hounded by patients frustrated at not being able to get medical attention. But it never happened. You see, as soon as word got around the community that someone might die in the clinic, everyone else stayed well away from the place. Partly out of respect for the staff’s priorities, but also because it was considered spiritually dangerous to be in a place where someone died. So I guess those ED customers took one look at that dead body and figured it was time to run!